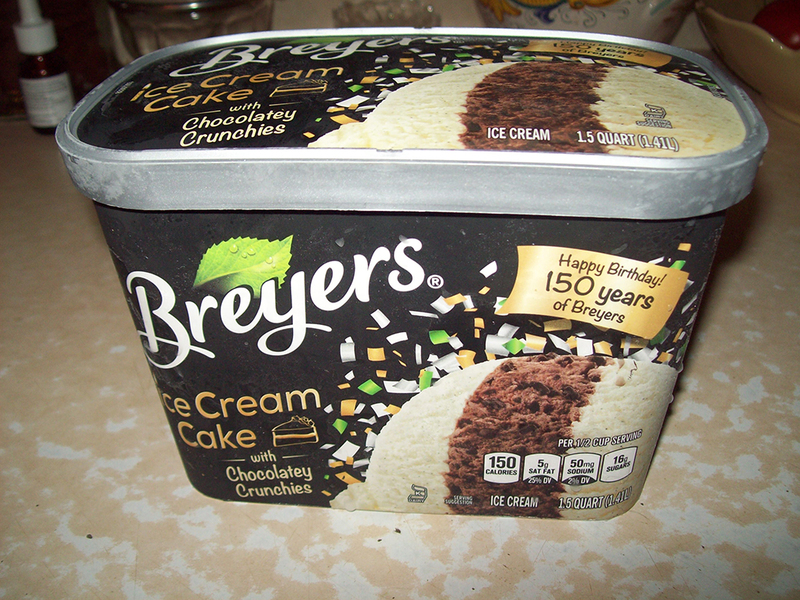 So Breyer’s is 150 years old this year, and to celebrate they came up with this brilliant creation, a variety of ice cream that’s based on ice cream cake. We’ve had cake batter ice cream, but never this, which makes me wonder how we’ve made it this far without someone else doing it. Either way, in the most meta of meta concepts, Breyer’s brought ice cream full circle, but cramming the essentials of ice cream cake into a container. Basically, this variety is vanilla ice cream, sandwiched around a mixture of chocolate ice cream and the beloved chocolate crunchies that everyone wishes there were more of in their ice cream cake. It’s nothing complicated, but it’s a novel enough concept since, as said, I’ve never seen other ice cream companies put something like this out. Considering how many people enjoy ice cream cake just because of the chocolate crunchies, it seems like a given, but who knows… maybe someone like Carvel owned the rights to manufacturing cookie crunchy pieces until 2016. 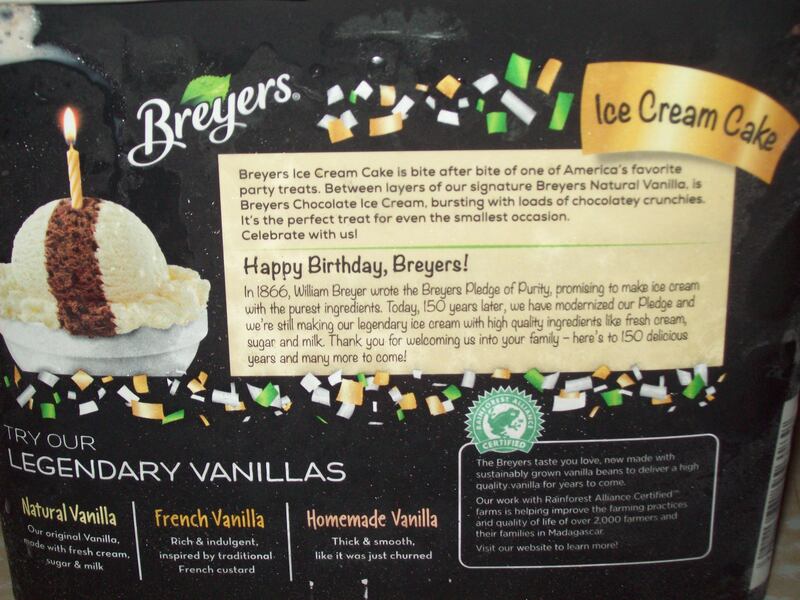 The ice cream itself is standard Breyer’s. It’s not the greatest vanilla or the greatest chocolate, but they’re both just fine. The main attraction here are the aforementioned crunchies, which are mixed into the chocolate layer. Personally I think it would’ve made more sense to mix them into the vanilla too so it has a fun, speckled look to it, but I guess they were going for authenticity, since the classic chocolate/vanilla ice cream cake only has them in the chocolate part. 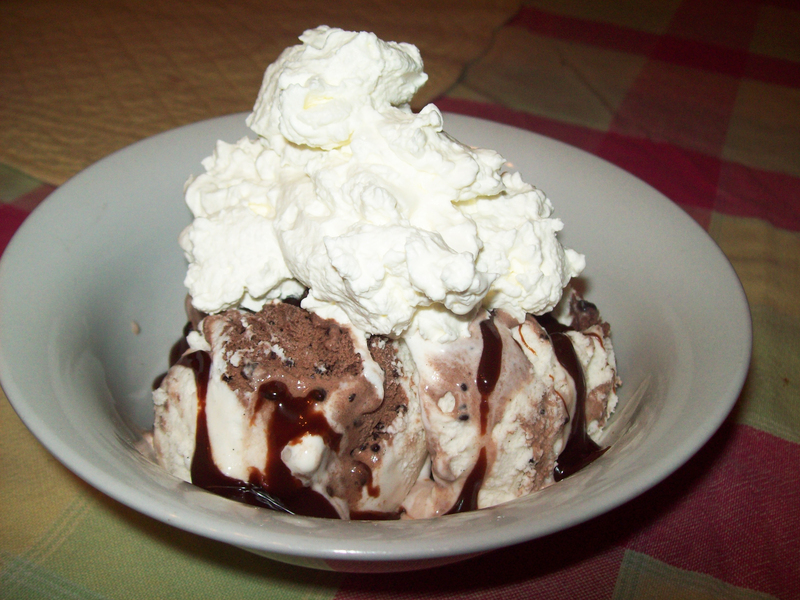 Like other combo-flavors of ice cream, once you scoop them into a bowl, it’s hard to keep the flavors separate. So unfortunately for all those food-OCD sufferers out there, you’re not gonna get to eat each individual layer on its own before moving to the next. The chocolate and vanilla will just marble together as you can see above. That’s not a bad thing, unless you’re REALLY neurotic about eating your flavors in order. Though if you’re putting that much thought and effort into ice cream, you’re kind of missing the point of ice cream in the first place. Regardless, the ice cream is just fine, nothing special. 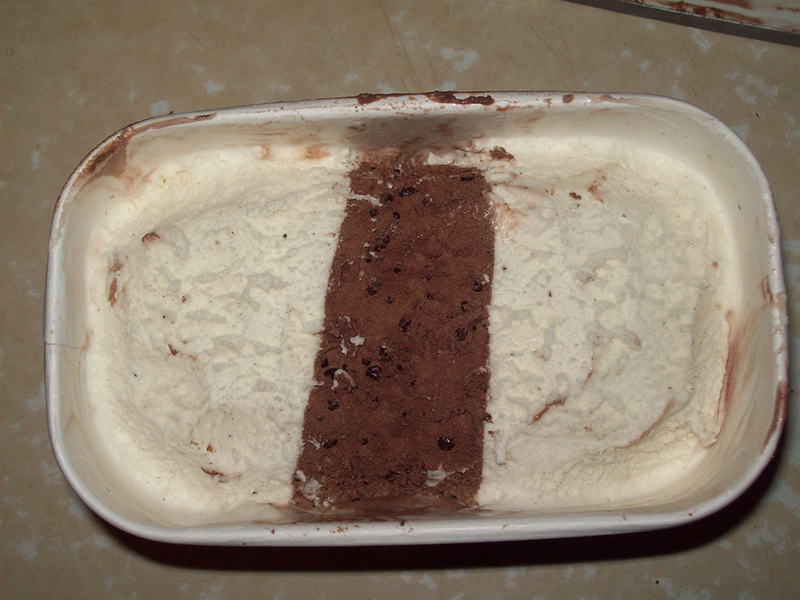 You get chocolate, you get vanilla. Badda bing, badda boom. The chocolate crunchies, meanwhile, do add a different dimension to this variety. They don’t seem like they’d make much of a difference, but really they’re what makes this a totally viable ice cream flavor. Without them, it’d just be chocolate/vanilla combination in one pack, which has been done in a bunch of different ways already. The crunchies themselves aren’t quite as crunchy as they are in a fresh ice cream cake, but they still get the job done. You get a nice crunch added to each bite, thanks to them. 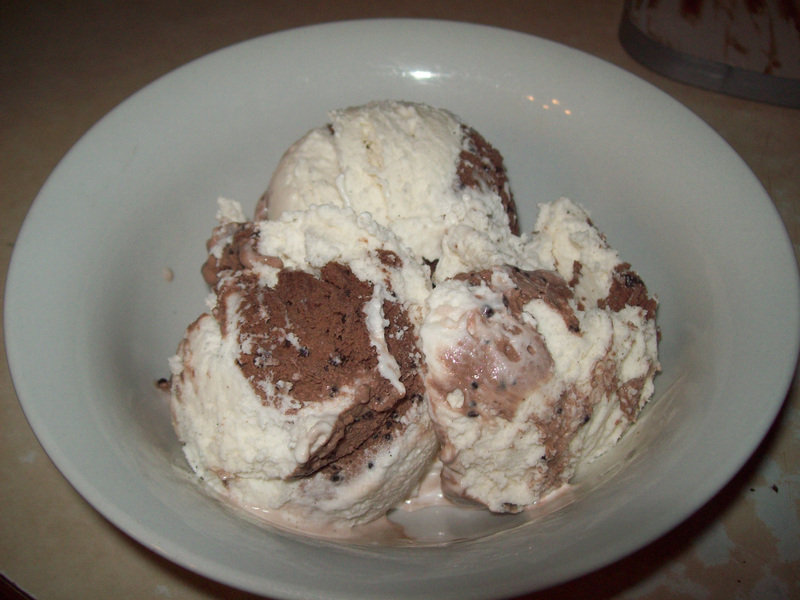 And actually, once you get your scoops in the bowl, it doesn’t matter that the vanilla doesn’t have crunchies since it all just sorta melds together. Should you eat Breyer’s Ice Cream Cake Ice Cream? Posted on August 23, 2016, in The Snack Report and tagged CHOCOLAAAATE, crazy crossovers, funtimes, ice cream, review, suh-weet!, vegetarian, yummy. Bookmark the permalink. 1 Comment.